These ten Self-Study Guides cover the passenger car and light truck series of ASE certification, tests A1, A3 through A8. They provide valuable information to help prepare for the ASE Certification Tests. Included within every guide is the ASE Task List, detailing exactly what type of knowledge and experience is necessary for the individual specialty. Easy-to-read text and illustrations provide the important background information you'll need to understand each area of certification and fill in any gaps which may exist in your technical knowledge. In addition, each self-study guide contains sample questions, written in the style of the ASE test, along with detailed answers explaining why a particular solution is correct. You'll gain valuable insight into how to take an ASE test and a useful reference manual you can use on the job. 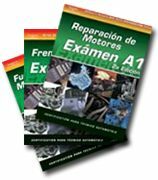 Car & Light Truck (Set of all 8 books): (A1) Engine Repair, (A3) Manual Drivetrain, (A4) Steering & Suspension, (A5) Brakes, (A6) Electronic/Electrical Systems, (A7) Heating & A/C, (A8) Engine Performance, (L1) Advanced Engine Performance, (P2) Parts Specialist, (X1) Exhaust.